Say “NO” When Communities Are Blackmailed For Basic Services: Don’t Encourage The Bastards! My urban planning student idea concerned the placement of those things that society needs but that neighborhoods shun hosting in their midst. My quintessential example at the time was a prison. Other examples are trash disposal or trash incineration sites or sewage treatment plants. It occurred to me that to make things more equitable, the things shunned should be paired with things neighborhoods might want. So I thought of putting the local jail for incarceration together on the same site or in the same building with a local police station. I know that not every neighborhood wants a police station. (Police, among other things, tend take over local streets with parking, often angled to fit more cars in.) But when I was conceptualizing this it was in the '70s: Crime was higher and I happened to grow up in a Gramercy Park neighborhood where the local police station and police academy seemed to be viewed as a benefit. An example of this idea being effectuated in real life is the 28-acre Riverbank State Park built on the roof of North River Sewage Treatment Plant jutting out from Harlem’s Hudson River shoreline between 137th and 145th Streets. The city got a sewage treatment plant and in return the people of Harlem got the amenity of park, although some would say that Harlem nevertheless got the short end of the deal accepting a plant other communities didn’t want and was then doubly shafted when the park was completed late with promised park amenities failing to materialize and the park budget being repeatedly cut. It was even closed for a while in 2010. The sewage treatment plant opened in1986 with noisome smells not under control. The park, planned from the beginning, finally opened in May of 1993. As you can readily see from this one real-world example there is a lot of Devil-in-the-details in making such a plan work. But that doesn’t mean there isn’t some genius in the essence of it. Nevertheless, since this the idea for putting a park over the North River Sewage Treatment Plant goes back to at least 1973 when funding was obtained for it, a few years before I was in urban planning school, I can’t successfully claim that I was the first one to conceive of pairing that which is desirable to a community with that which is not. It may seem strange that I am beginning an article with an idea that I credit as having meritorious aspects as my preface to excoriating the astoundingly horrible new urban planning strategy that this article is really about. That really horrible new approach to city planning, which I urge communities to reject out of hand and refuse, absolutely, in any way to collaborate with, is the strategy of withholding basic city services in order to bribe/blackmail communities into accepting bad development that they don’t otherwise want. I am beginning with a potentially good idea as prelude to discussing this really terrible practice in order to make important distinctions, even if a few of them might seem subtle. The distinctions are important for people to understand and appreciate how bad this new practice is. As best as I can date it, this new highly objectionable bribery/blackmail strategy originated in the Bloomberg era during which it has been resorted to by city officials with despicably rampantness as a device to push through development approvals. You can read about it here: Friday, February 1, 2013, City Strategy Of Withholding Basic City Services To Blackmail Public Into Accepting Bigger Development. In that previous Noticing New York post you can read about the smoking gun e-mails that showed that government officials were intentionally holding back on providing a much needed community school in order blackmail the community to accept a bigger Walentas developer Dock Street project project than the one the community had previously rejected. (That Walentas Dock Street project was strong-armed through the City Council by Speaker Christine Quinn, in an unusual move, over the objections of the local city council member.) You can also read how essentially the same thing is now being done with another Walentas project near BAM, where a library is being promised if the community tolerates nearly doubling the size of that project. Libraries and schools are essential community services and provision of them should not be conditioned on putting through bad development. I’ll discuss this more in a moment. First a segue to make distinctions. • Planning measures that “mask” objectionable development. 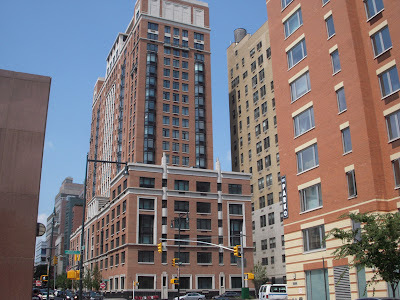 A number of years ago, in the early 2000s, I communicated with Borough President Marty Markowitz (as a private citizen ) to support a variance to allow greater height and density for Brooklyn Law School’s Feil Hall, being built to provide residences for law students. I am a fan of development and favor adding density when appropriately done. (I am also an alumni of the law school.) I made the argument that added density in this area of town, near a confluence of subway lines, was good. (I later worried that Mr. Markowitz might afterwards have thought that this was a valid argument for the extraordinary density of Atlantic Yards- It is not.) I also made the argument that adding density at that location on Brooklyn’s State street near court street would help mask (by helping to overwhelm them) the negative aspects of the jail there, the Brooklyn House of Detention. I guess I was sort of hearkening back to my earlier planning school idea. 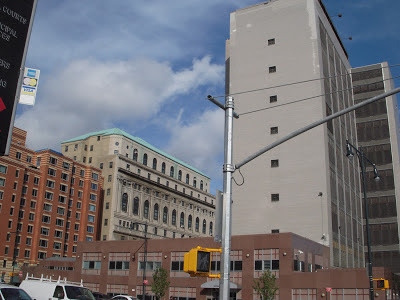 Years later there was another thing I wondered about my communications with Borough President Markowitz: Whether I had inspired his plan launched later to hide the Brooklyn House of Detention in a sandwich between two new abutting condominiums. The scheme, perhaps not so harebrained as you might think, could have somehow worked. But only if the functions of the jail were not interfered with. • Cleaning up after a landfill. After the many years a landfill is in operation clean-up goes on for many more years frequently to create a park. It might sound similar to the exchange in Harlem where a park accompanied a plan for waste disposal. By contrast, the period during which the negativities of the landfill are endured are so removed in time from the day when the benefits after clean-up are finally enjoyed, it is not the same thing. It is not concurrent: The population that endures the negatives may ultimately with the passage of time and community change be generations different from the population that one day benefits in what maybe a gentrifying neighborhood. • Developer fees. Many suburban communities jump on the chance to charge subdivision developers fees that will pay for the assumed additional costs of a growing community: enlarging schools, police and fire departments, building roads, etc. The wisdom of such approaches can be debated. In New York City we tend to do the opposite, the wisdom of which is also subject to question: We try to encourage new development by exempting it from paying taxes. Doing both, charging fees and encouraging through exemption from fees/taxes is essentially chaos, which, unfortunately doesn’t mean that it doesn’t sometimes happen. It absolutely does. If you exempt new development from fees then you hope that in a big city like New York all the other taxpayers can carry the load. But if you get a big surge in development across the city or a single really big project in one location, suddenly overburdening existing services, then you are arguably in the same situation that causes suburbs to argue that, as a matter of policy, they should charge fees when big developments come on line. • Inclusionary zoning. In New York City “inclusionary zoning” is a term used to describe the creation of “affordable” housing units in new construction or development by requiring in the zoning code that such new development contains a percentage of such units. The term evolved as an antonym term and counter to what is referred to as “exclusionary zoning,” the prime example being when a suburb creates zoning restrictions such as large minimum lot requirements aimed at making it too expensive for lower-income families to reside in an area. A practice like minimum acreage zoning thwarts the provision of more affordable housing a free market would otherwise provide. In New York City it is different, almost the opposite: The free market doesn’t incline itself to provide affordable housing for lower-income families in gentrifying neighborhoods and inclusionary zoning is intended to serve as a counter to free market decisions. Whenever one decides to counter the natural choices of the free market sober thought should be devoted to whether the intervention is, indeed, as wise as believed. In one respect the city’s inclusionary zoning may be thought of as a good tool to buffer the rampant market forces unleashed by government when it significantly upzones an area, potentially clearing an area almost as effectively as urban renewal (although rebuilding is more likely under this scenario). It is what in Noticing New York articles I have referred to as a “death sentence” by density. Upzonings, especially abrupt and big ones, can result in the removal of many affordable housing units that might have happily persisted without such provoked redevelopement. Inclusionary zoning requirements can reduce the incentive to rush forward with demolitions and can also help replace the affordable units that disappear when they are demolished. For the city to offer an elective option to developers to build at greater density if they include affordable housing units is probably bad policy (even if it might buttress the legal defensibility of the practice) because there isn't a true either/or involved: Developers will always make the election that is best for them, not for the public. They will obey the math of what the market dictates. Meanwhile, the most desirable They will obey the math of what the market dictates. Meanwhile, the most desirable density to have in an area is what it is, irrespective of the number of affordable housing units created. And what should be the desirable number of affordable units replacing old ones should simply be whatever it is, irrespective of density. The two should not be intermixed and then left to a developer's decided vote on what is best for them, not the public. Bottom line though, a policy of steering the market so that it replaces units it is destroying and would otherwise fail to provide is not the same as that other strategy we are about to return to and discuss again: the ploy of withholding basic city services to blackmail the public for tolerance of otherwise undesirable development. The library that is proposed to be put into the Walentas building if the community tolerates the upzoning of that building is being talked about by the Brooklyn Public Library system as a replacement that would help serve as a premise for the BPL to sell another library, the Pacific branch library at 4th Avenue and Pacific Street. The community has been fighting to preserve the Pacific branch, not wanting to see it demolished. So it makes sense that many community activists see this as a doubly-damning strategy: Blackmailing for a library conjoined with the removal of a wanted library. Consequently, many activists oppose the library in the Walentas building simply because of the way its creation would put the Pacific library in much greater jeopardy of being closed, sold and demolished. That blackmailing for the greater density is also involved is icing on this cake. In other words, (and this is something I could conceivably get behind and endorse): The calculation was that two libraries are better than one. So the thought was: Let’s demand two. That’s fine, but only so long as the community does not engage in this kind of bargaining for public benefit. The community should not be agreeing to tolerate undesirable extra density for the Walentas building in order to get a library. Why? . . .
Each time such a blackmailing scheme works, each time the community engages in such negotiations, it makes it seem more right, more expected, more the status quo. It becomes ever so much easier for city planning officials to do it again. Bad development is bad development. Good development is good development. Bad development* doesn't become good development because the community has been bribed with a library or other essential city service that should have been provided anyway. The reason these schemes that blackmail through the withholding of basic services should not be tolerated is because it becomes a potent incentive for the powers that be in this city to look for other basic services that can be withheld to bargain for other exchanges, other bad development harmful to the communities of New York. Ergo, the proposed increase of density for the Walentas building needs to be evaluated entirely on its own: It is either a good or a bad thing and should be approved solely on that basis. It cannot be bargained for by withholding basic services. It's axiomatic: You don’t negotiate with hostage takers. You might talk with them to try to bring them back into a more human frame of mind, but you do not negotiate with them. One parting word: You may be interested to know that there is a Citizens Defending Libraries petition (Save New York City Libraries From Bloomberg Developer Destruction, now about 7,800 signatures- with which I am involved) objecting to how libraries are being sold and underfunded and New York’s library system shrunk because the system’s focus has become the creation of real estate deals for developers. Libraries should not be hostages for development. The city should cease the practices of bribing the public into approving bigger and denser development and pressuring communities into accepting libraries housed in smaller spaces with fewer services. This post may be updated with a few additional comments and certainly with a link to Atlantic Yards Report coverage of the hearing this evening (no doubt quite thorough) for the court-ordered redo of the environmental impact statement for Atlantic Yards which was necessitated because the original EIS did not take into account how much longer the meg-project would truly be likely to take. The testimony of Noticing New York was actually delivered in two segments during the evening because of the three minute limit for oral comments. In addition to the comments you see below, I extemporized a bit when I resumed to deliver the second half of my comments in order to refer to the comments of Deb Howard of the Pratt Area Community Council describing the kind of nearby development that has occurred in Brooklyn in a bad economy absent the kind of interference of Forest City Ratner that has more or less halted development nearer to the vicinity of Atlantic Yards. While extemporizing, I also pointed out how many of the people testifying during the evening were there as a product of living with a Forest City Ratner together with their apparent inability to imagine alternatives to it. That includes the few union laborers who showed up to speak on Ratner's behalf despite the his double cross (see footnote at end of testimony). Another important note. There was some pretty devastating testimony from Michelle Del la Uz and the Fifth Avenue Committee. It was something that had not previously occurred to me: That, because of gentrification, the delay and extended schedule Forest City Ratner has been able to command for itself (by virtue of being a monopoly) build will totally change the income levels (raise them) of those for whom apartments will be provided, disqualifying the lower income families who would have been eligible to qualify (albeit already dispiritedly small group given the tailoring of the CBA to benefit the developers courtesy of ACORN) and shutting out many black families because of the structuring of the lottery that will apply. Coverage by Atlantic Yards Report, including a fuller description and video of the above is available here: Friday, March 01, 2013, Hearing on Atlantic Yards environmental review: critics suggest other developers be considered to achieve ten-year buildout; Forest City supporters urge removal of review roadblock (but avoid timetable). The following is Noticing New York's testimony. This comment is being offered in the name of Noticing New York, dedicated to the insistence on good economic development policies in New York and the proposition that developing New York and appreciating New York must go hand in hand. I offer this testimony as an attorney experienced in real estate, as an urban planner and as former senior government official who worked for more than a quarter of century in the areas of public finance and development for the state’s finance authorities. • This hearing on the necessary dismantling of the Forest City Ratner Atlantic Yards mega-monopoly is long overdue. As every economist knows, it is axiomatic that you can’t negotiate with and you can’t effectively regulate a monopoly. You can’t even enforce legal documents, which explains why Empire State Development Corporation CEO Marisa Lago indicated in her public statements that she expected that Atlantic Yards will likely take on the order of four decades to complete even though the legal documents (then unreleased) call for its completion in twenty-five years or less. How much longer the community will be blighted beyond what was addressed in developer PR and in the complicity-flawed and manipulated EIS is a large part of what this hearing is about. • This hearing and the revised scope of the EIS will be insufficient unless it considers the full scope of the Forest City Ratner mega-monopoly whereby governmental support and subsidy is suppressing economic activity and competition in Brooklyn. Atlantic Yards is not truly a 22-acre project: Forest City Ratner has been governmentally assisted in acquiring more than 30 contiguous acres over which it is exercising exclusive rights, 19 towers, not 16. . an arena plus two shopping malls. When you also include other nearby property where Forest City Ratner is getting government assistance to squat over the borough’s major subway lines, there are currently more than 50 acres of exclusive rights. • The developer PR put out in preparation for this hearing pushes the importance of the tepidly-tempered notion that public reaction to the so-called “Barclays” arena (named after a disreputable bank) has not been quite as negative as predicted. Gee, after inviting the world to gawk at the glitz of the Ratner/Prokhorov arena, that heaped pile of pirate plunder representing what has been stolen from the community and the deep subsidies diverting public resources from everywhere else, and the news pushed out is that the reaction to all that glittering treasure in one place hasn’t been that negative? Whoop-dee-do! That’s damning by faint praise, not to mention that problems during construction were far worse than predicted. • In fact, Atlantic Yards is a rolling disaster area. In the mid-‘90s when I was at the New York State Housing Finance Agency, the Affordable Housing Corporation and the State of New York Mortgage Agency I worked with the New York Housing Partnership to provide subsidy to Forest City Ratner for Atlantic Commons immediately adjacent and to the north of the Atlantic Yards site. As state agency officials we scrambled and strove to do everything we could to push the envelope, prioritize and ensure that Forest City Ratner got subsidy for that site and, at the time, it made sense to me because we were filling in a hole, blight going back to 1960 created by urban renewal clearances that, after decades, had been left gaping and unfilled. I especially believed that we needed to do something because I had also been asked to help find solutions for the aftermath of that government bulldozing more than a decade before, in the early ‘80s when I was at the New York City Housing Development Corporation (HDC). Little did I know that no sooner had we finally succeeded in this government effort to fill in the destruction, than Forest City Ratner would use that success we furnished as a launching pad to renew and extend the decimation of the urban renewal area, expelling competing owners and developers from the vicinity. • Important Footnote: When we financed Atlantic Commons we put back streets and sidewalks that urban renewal had removed, something that should now be done in dealing with the Atlantic Yards site. • This is a rolling disaster because it has created a self-feeding cycle of corruption. Atlantic Yards Report articles have described in fastidious detail all the ways the Forest City Ratner environment harbors a “culture of cheating” besmirching the many government officials it draws in. Worse than that, I have watched as what was once illegal has been treated as if it is now legal and acceptable, the abuse of government’s tool of eminent domain for private purposes being just one aspect of this. • This is a rolling disaster because the unfair power advantage enjoyed by Forest City Ratner has been extended, the cocked playing field tilted even further, including through influence over BIDs, by having other neighboring landowners shoulder the taxes, special assessments and BID contributions from which Forest City Ratner gets exempted. • It is a rolling disaster because the continued deep, exclusive and self-perpetuating cycle of subsidization of the Ratner mega-monopoly turns city, state and federal money* into a launching pad for, and lure to, other nefarious developers for similar land grabs and abuses of the public trust. Would we have asset-stripping at Long Island College Hospital (LICH) or the underfunding and selling off of our libraries were it not for the way that the Atlantic Yards abuses have been tolerated? Some are even glorifying the impunity of it all. The impact of continuing to assist such social disequilibriums must be addressed in the environmental impact statement. the petition and campaign to oppose the defunding of New York City's libraries, the shrinkage of the system and the sale of library real estate in deals that prioritize benefit for developers. The site has links to articles pertaining to the current situation (including a number of Noticing New York articles), the petition, action steps and information about upcoming events and meetings (including weekly organizational meetings). For instance, Thursday, (February 28, 2013) there will be a meeting at the library in Brooklyn Heights Library (280 Cadman Plaza) about the proposed sell-off and shrinkage of that library, possibly to Forest City Ratner (that will include attendance by elected representatives, City Councilman Steve Levin and State Senator Daniel Squadron and representatives of the Brooklyn Heights Association) and on Friday, March 8, 2013 there will be a City Council hearing about the city budget for libraries meaning that it will provide a forum for addressing the defunding of libraries and the “demolition by neglect” of the library system preparatory to its shrinkage through the proposed sell-offs to developers. The Citizens Defending Libraries site will keep updating so it can be visited periodically to keep up-to-date with the latest information. 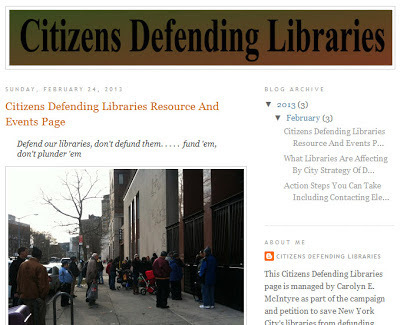 Those wishing to access a complete list of Noticing New York articles about the situation concerning libraries can do so here by clicking on the “libraries” label at the bottom of this post. Breaking news! The Brooklyn Public Library has announced that (like the New York Public Library system administrating such services in Manhattan, the Bronx and Staten Island) it's got libraries to sell!. .
. . . the libraries for sale we have been officially informed about (at this time- there are more we haven't been told about) are the local branch library and Career and Business library in its Brooklyn Heights building on the border of Brooklyn’s Downtown Central Business District, and the Pacific branch library at Pacific Street and 4th Avenue just yards away from the new deeply subsidized “Barclays” arena. These two Brooklyn library sites both happen to be next to what are now Forest City Ratner-owned properties (acquired with government assistance and no bids). Through its spokesperson, the BPL has asserted, in absolute terms, that it envisions it may sell the library property to Forest City Ratner in what it would foresee to be a “public-private partnership,” notwithstanding that Forest City Ratner has notorious expertise in abusing such relationships that are actually better described as developer-driven private-public partnerships where the private developers take over and privately exercise government functions. “Leverage” is a clever, banker-ish sounding term, used here to mean nothing more than “sell,” even if it strives for the promising ring of being something more. That's because system libraries are owned by the city (not the BPL), which takes any money whenever property is sold off. It can't be helped (see "fungibility"). 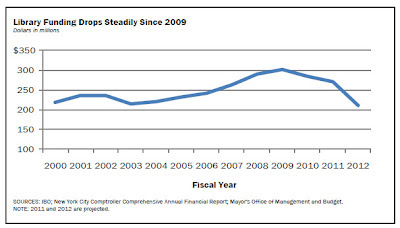 For the last several years Mayor Bloomberg has established a pretty good record of withholding city funds from the libraries even as usage is way up. Some would say Bloomberg just doesn’t care about libraries. Others would say he consciously decided to starve the system into submission, the kind that forces the sort of “creative” thinking that results in sale of library real estate and shrinkage. 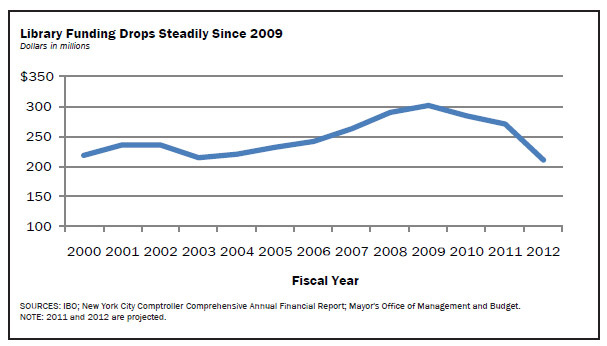 Chart from Center From Urban Future report showing sharp decline in funding against escalating use. That bump in funding? Read on. Those suspecting the latter would be inclined to observe (see chart) how the decline of city funding for libraries coincided with the adoption of the strategic plan to "leverage/sell" them even while usage was going way up. In other words, a strategy of "demolition by neglect" with library system officials racing to allege that buildings are more deteriorated than is really true. The greatest shame of such a plan is that it, even if it shakes loose a few real estate deals, maybe a few every year, it is a travesty to continually drive all libraries and the entire system into the ground financially. If library real estate gets sold, some juicy real estate deals can get handed out to the always influential real estate industry, with profits that can be particularly sweet if those deals are handed out in the form of developer-driven private-public partnerships that preclude effective competitive bids to protect the public. The lure of sweet deals. . . Can libraries protect themselves? If they could, they would no doubt do so with words. There is something about the physicalization of words. We associate it with libraries. Libraries are not places like a politician’s rally where spoken words just wash over us, soon to disappear into the ether of broken and forgotten promises. Words exist solidly in libraries with a sense of permanence and history. We also associate the physicality of words with magic, with faith, commitment and with binding moral oaths, like the phylacteries worn by observant Jews during weekday morning prayers, containing parchment with verses from the Torah, or the carefully phrased inscriptions inside rings and lockets, the Bibles we swear upon before delivering legal testimony in court. . . . 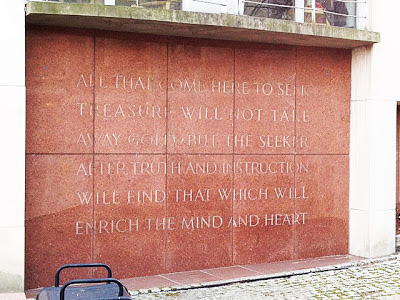 In much the same way we often inscribe our buildings with words, much as if those carved words will serve as talismans consecrating our hopes of how a space, a place or building will be used. In Manhattan, the Central Library Plan involving a consolidating shrinkage and sell-off of important Manhattan libraries is further along than the plan to sell the Brooklyn Heights libraries into a developer-driven private-public partnership. 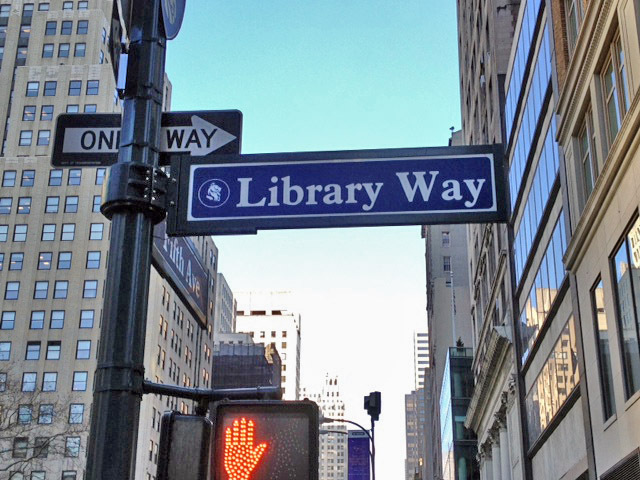 Two of the four Manhattan libraries involved in that (never fully publicly revealed or discussed ) plan for consolidation, shrinkage and library real estate sell-off are the library's landmark main building at Fifth Avenue and 42nd Street.and the Mid-Manhattan circulation and branch library across Fifth Avenue. . . The quote is just one of many on a series of plaques on 41st Street’s Library Walk (the local street sign proclaims the street to be “Library Way”) that leads to the libraries from the east. I should disclose that the petition was posted by wife when she became passionate about doing something about these library sales after attending the meeting where plans to sell off the Brooklyn Heights library site were described to the community for the first time. Another brass insert into the sidewalk of Library Walk, a notice defending the line between private and public property, in this case for the private property owner's sake. Just in case the libraries can’t actually speak with sufficient eloquence on their own behalf in this fashion, there are others have been speaking up for them. • Wall Street Journal: Undertaking Its Destruction, by Ada Louise Huxtable, December 3, 2012. • New York Times: Critic’s Notebook- In Renderings for a Library Landmark, Stacks of Questions, by Michael Kimmelman, January 29, 2013. A new Center For An Urban Future report just out this January makes clear how usage of the city’s libraries is way up even as they are being defunded and having to keep shorter hours. The report, which eloquently describes in detail why New Yorkers are flocking to libraries, tells us that despite cutbacks “New York’s three systems all experienced higher program attendance levels than any other system except Toronto.” It also tells us that we fund our libraries at a level where we keep our libraries open less than Detroit- Detroit is nearly bankrupt; we are a wealthy, growing city. The New York City Independent Budget Office (IBO) pointed out how underfunding by Mayor Bloomberg is jeopardizing the system’s libraries. The bump up in that graph? Remember that 2009 was a city election year. . . In fact, 2009 was that same election year when Bloomberg spent more than $105 million of his personal funds in direct campaign expenditures to overturn City Charter term limits and run for his third term as mayor. (That’s not to mention more than a half billion Bloomberg spent from his personal fortune to exert his influence and win the election in other ways.) Both the mayor and City Council members were running for new and extended terms in that election. Libraries are not expensive either in absolute terms or relative to other things or their substantial benefit to communities. Information coming from The Albert Shanker Institute about libraries across the U.S. makes this clear. In fiscal year 2008 (again, according to the U.S. Census Bureau), there were roughly 9,300 public libraries in the U.S., with a total cost of around 10.7 billion dollars. That figure represents roughly 0.4 percent – four tenths of one percent – of all state and local government expenditures. On a per capita basis, this is about 35 dollars per person. Look at the figures in the Center For An Urban Future report: $274 million for operations? That’s far less than Bloomberg gave out of his personal funds to Johns Hopkins in January. Overall, he has now given $1.1 billion to Johns Hopkins as of this year. NYC’s budget is over $50 billion a year. The Donnell Library one-shot sale, with all its disruptions to the system and the community, grossed only $67.4 million in July 2011 (for which you don’t see a bump up in spending). As a percentage of the city’s budget that involves decimal places of a single percentage point (.235%). From the Center For an Urban Future Report: More people visited public libraries in New York than every major sports team and every major cultural institution combined. But we are subsidizing those other institutions, (including glaring examples like Yankee Stadium and the “Barclays” arena) much more deeply! Mayor Bloomberg is defunding New York libraries at a time of increasing public use, population growth and increased city wealth, shrinking our library system to create real estate deals for wealthy real estate developers at a time of cutbacks in education and escalating disparities in opportunity. It’s an unjust and shortsighted plan that will ultimately hurt New York City’s economy and competitiveness. I am going to let the images here speak for themselves about that. • The community needs its hospital. 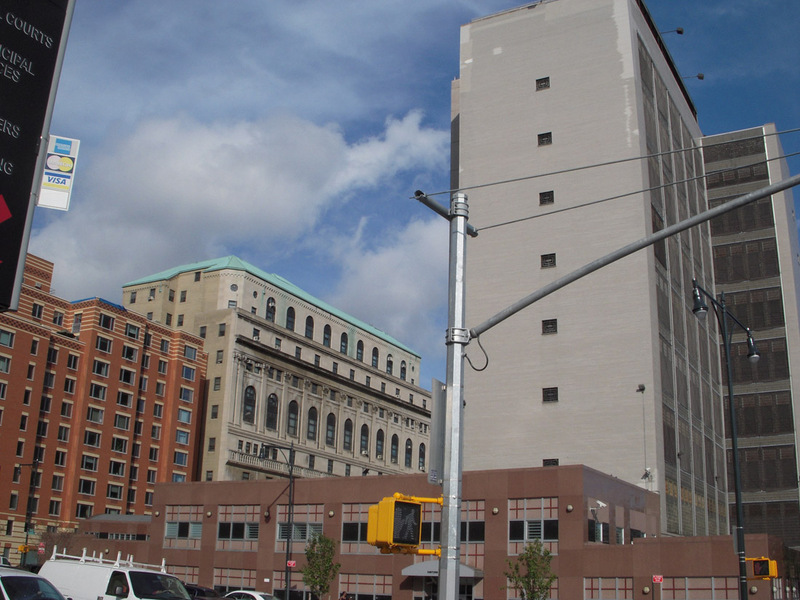 • The doctors and financial staff affiliated with the hospital are pretty well convinced they won’t have problems operating the hospital in the financial black if SUNY Downstate would just leave them alone to do it, thank you very much. • That the integration of LICH into the SUNY Downstate system, which was ostensibly for the purpose of ensuring the future of LICH, has had the opposite effect. • That instead of a good faith effort to run LICH as a successful hospital, a plan of asset stripping was being implemented almost immediately. That meant, among other things, that no money was invested in the hospital with any significant expenditures being made (theoretically for the hospital) directed exclusively to portable assets that could easily be removed from the site when the secretly envisioned closure that was being worked toward takes effect. 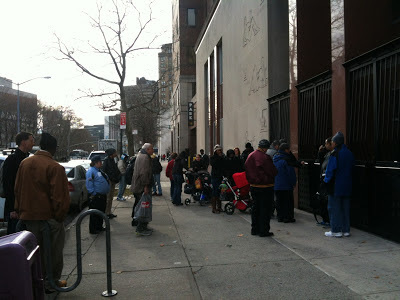 More analysis and a petition to prevent the closure of the hospital is available here: Wednesday, February 13, 2013, One-Stop Petition Shopping: Report On The Brooklyn Heights Association Annual Meeting, LICH and Libraries. The crowd standing to chant "Save LICH"
Mayor $25 Billion-and-counting-in-personal-wealth-since-entering-politics Bloomberg is visiting the piled-up pirate plunder of the so-called “Barclays” arena today to deliver his (last?) State of the City Address. Norman Oder’s Atlantic Yards Report today has new calculations posted about the freebies handed out to Ratner for that Ratner/Prokhorov arena just in terms of land: $124 million? See: Thursday, February 14, 2013, Uncounted savings on the Barclays Center: perhaps $124 million in free land for developer Forest City Ratner. Mr. Oder carefully adds updates, just with respect to city land giveaways for the arena, the cost-of-subsidy-to-Ratner calculations Noticing New York has addressed on previous occasions: See: Wednesday, October 10, 2012, Weighing The Change In Brooklyn: The True Cost Of “Barclays” Center Glitter, The Cost Of “Barclays” Center Tickets and Monday, February 8, 2010, Award of No-Bid Mega-Monopoly Means Forest City Ratner Hopes To Claim an Awful Lot of Housing Subsidy, ALSO Without Bid. The total cost of subsidies to Ratner with respect to just 22 acres out of the 30+ contiguous acres of the Ratner Atlantic Yards mega-monopoly is in the billions ($2 to $3 billion). No one has yet tried to aggregate the cost of the Ratner subsidies for the entire 30+ contiguous acres, not Noticing New York, not Atlantic Yards Report, not the New York City Independent Budget Office, (IBO). It would not be nearly as important to pay attention to the almost obsessively fine-tuned calculations Mr. Oder presents with respect to the arena land giveaways if this heap of “uncounted” subsidies had not been given to Ratner without competitive bid. More than once, the MTA, the city, and ESDC made it very clear they did not want an effective bid process bringing in alternative bidders to compete with Forest City Ratner. . .
. . . This was important on Day One when the deal was intentionally structured as a “private-public” partnership with Forest City Ratner, where the priority was to set up and then protect a Ratner monopoly on the development opportunity of all those multiple acres and it was subsequently important as the terms of the deal with Ratner have been continually and malleably shifted to confer even greater benefit on Ratner. Taking such a careful look at the actual amount of these subsidies would hardly matter if Atlantic Yards, like the properly-managed Battery Park City, was carved into multiple building sites and bid out to multiple developers. That’s just what the community is demanding and it can still be done with the rest of the enormous site. And if that is done we can start paying for essential city services like libraries. Instead, it looks like Bloomberg wants the city to sell off city libraries, including the Brooklyn Heights branch and downtown business library, and the Pacific Street library, likely enough to Forest City Ratner, in a “private-public partnership” so that we can be faced with all sorts of other deep, hidden subsidies to the likes of Ratner that are a challenge to ferret out and properly count. The Brooklyn Heights Association Annual Meeting was held Monday night and the big news of the night concerned two items of significant concern that are remarkably similar in theme and associated suspicions about underlying mischief on the part of theoretically charitable institutions misconducting themselves. One of these two events involves, the selling of Brooklyn Heights’ downtown library as part of a city-wide mayoral program of defunding New York City libraries and shrinking the library system at a time of increasing public use, city growth and increased city wealth. The new priority of the library system has apparently become the creation of real estate deals for real estate developers. The other event involves the selling off of Long Island College Hospital (LICH), the only hospital for the community in the immediate vicinity, once again, because there are those who are salivating to create real estate deals. The guest speaker of the evening was Congresswoman Nydia Velazquez who spoke concerning the importance of President Obama’s pitted battles with Republicans who are right now intent on restructuring the federal budget for the plutocratic benefit of a few at the expense of the rest of us. In other words she was speaking about matters on a federal level quite parallel to the principal local concerns of most of those attending the meeting. I’ve written about those precepts here: Sunday, June 24, 2012, Sports Glummery. What Jane Jacobs wrote about in "Sytems of Survival" has very on-target application to the LICH and Library situations where those who should be protecting the public wind up not doing so because they get distracted, when they shouldn’t, by lucre. The only problem is that, if you haven’t yet spent some time with them, the concepts in that book could be a little abstruse for an auditorium crowd. At one point Jacobs uses the word “immiscible,” which is a way of describing things like oil and water that don’t properly mix. The book, which as its title indicates, is about the morality of systems, convincingly argues the flaws of trying to mix things that should not be mixed, particularly mixing business enterprises with government and politics, because the moral systems that apply to each must necessarily remain different and incompatible (so much for the current fashionability of today’s “private-public partnerships” like Atlantic Yards). In closing, I want to comment on two new and very troubling events that are affecting our neighborhood. The first is the likely closing of the Brooklyn Heights branch library because, according to the spokesperson for the Brooklyn Public Library, the facility needs millions of dollars of repairs and upgrading. * The plan would be to turn over the site to a developer who would demolish the existing structure, build a new branch library in the new building while the business library would be removed to Grand Army Plaza. The second event is the decision by Downstate and the SUNY board to close Long Island College Hospital . . .
. . . which will leave a giant hole in the health care needs of residents of Northwest Brooklyn. SUNY claims it’s losing money operating LICH, but a letter from Carl McCall, president of SUNY, to our elected officials details the financial problems with the SUNY University Hospital, not LICH. Many people feel that the underlying agenda is to allow SUNY to sell off the valuable real estate at LICH for development. The final decision about LICH will be made by the New York Department of Health and, ultimately, by Governor Cuomo. There’s information outside with the contact information for both of those individuals if you want to write or email the Department of Health or the Governor. It seems to me, using Jacobs’ construct, that there’s an imbalance today between the two systems, fueled by the notion that every property ought to be put to its highest and best use, in spite of any common needs that a society might have. This imbalance has put the caretakers and guardians such as City Planning. Community boards, Landmarks, other nonprofit institutions, at a financial disadvantage as they struggle to perform their mission in society. In the case of LICH, no one is asking how we can maintain this important and viable hospital. But, instead, there is ample evidence that the facts are being skewed in order to accomplish the entrepreneurial goal, not the caretaker goal. In the case of the library there appears to be an intention to continue its mission by building a more centrally located* business library. I would hope that any deal would include a healthy sum from a developer for the Brooklyn Public Library’s endowment. We shouldn’t be in such a hurry to sell off assets so cheaply. This concludes my report and I will be happy to take questions after our community awards and our guest speaker. As I will get to in a moment, and as you can well imagine, many in the audience who had come to address the LICH and library issues that evening were very eager to ask those questions, particularly to ask about the stance the BHA will be taking to protect the community. First, let me comment that the reference President McGroarty made to Jane Jacobs’ “Systems of Survival,” although it may possibly be regarded as somewhat abstruse, is very apt to make the point that the infiltration of entrepreneurial greed is not good when it is allowed to reset the priorities of what should be “charitable” institutions. Those institutions are supposed to be looking out for the general public welfare. Jacobs' analysis cautions us about how the danger of that not happening is extraordinarily accentuated when one risks mixing the “immiscible” with so-called “private-public partnerships” where government functions get taken over and driven by private developer agendas. So my first assumption (which I wanted to confirm in the ensuing questions I expected Ms. McGroarty would answer at the end of the meeting) was that the BHA would object to any developer-driven “public/private” partnerships if the library site gets redeveloped. The library system has actually stated that it is interested in such a partnership and that it is not ruling out that such a partnership would be with Forest City Ratner, a development firm renowned for its expertise in manipulatingly abusing such setups for their own agenda. As the Brooklyn Heights library property (as is another in Brooklyn) is immediately adjacent to existing Ratner government-assisted property, I have noted that the library and its demolition may be in Ratner’s sights. During the cocktails that followed the meeting I was informed by people who have dealings with the library that the secretiveness of the library's management about what is going on gives a vibe that there is already a handshake deal for the city to give the property to Ratner (likely on a no-bid basis). One of the huge frustrations in dealing with these “charities” that depend so much on taxpayer-funded cash flow to operate is how much we are ultimately at the mercy of those elected officials in control of the bigger picture, Mayor Bloomberg in the case of the libraries and Governor Cuomo in the case of LICH. 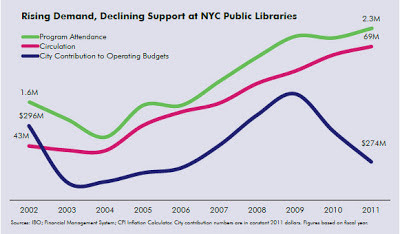 Mayor Bloomberg is underfunding the city library system at a time when usage is up, 40% programmatically and 59% in terms of circulation. This intentional underfunding helps make the real estate deals the Bloomberg administration is looking to hand out plausibly defensible. If members of the broader public wanted to thwart this tactic by collectively donating extra funds to the libraries it wouldn’t work, because Bloomberg has already decided at what level he wants the libraries funded and he can simply subtract out a dollar of city funding for every dollar the public donates to try to close the gap between supplied and desired services. If you understand accounting and how money is fungible you will understand that putting money into a library endowment fund is meaningless. The only thing the public can meaningfully negotiate for is that full, proper and complete funding for the library system resume. One way we will know when this has happened is when, like the (bankrupt) city of Detroit, the (wealthy) city of New York is keeping its libraries open longer hours, not closing on weekends, and staff is rehired. It is absolutely clear that the Othmers intended to benefit the community interests in Brooklyn they cared about, but in a story that is much too long and complicated to recount here the money they left to LICH was raided, siphoned off by Continuum Health Partners. The community has complained how subsequent infusions of cash for LICH seem to have vanished. One minute LICH is reported to be operating in the black and the next it is supposedly in the red. Hospital accounting is far too mysteriously malleable and complicated. I’ve written about this before when writing about St. Vincent’s Hospital, another example where people running a hospital took their eye off the ball, salivating over a shell-game real estate deal: The hospital went bankrupt and what survived was the real estate deal. When I was a lawyer in government one of the things I used to do was finance hospitals. In fact, I worked on the financing of LICH. I was involved in the negotiations and policy review that applied when the community gave up parkland (there was a swap involved) so that LICH could have a new parking garage. * At the BHA meeting one audience member astutely suggested that the parkland be given back to the community (rather than used for high-end condos) if LICH is ultimately closed. Hospital accounting in New York State is far from easy, counterintuitive and, at best, can only be understood by experienced insiders. Regulations involving highly complex reimbursement formulae force hospitals to operate constantly on the brink of artificially narrow and rather manipulable profit margins. The net, net of all of this is that, just as with libraries, it is not sufficient for the community to pump money into an institution to save it because that money can be made to disappear with accounting tricks. The only thing that works is to demand government’s commitment to making the institutions work. • No developer-driven “public/private” partnerships to build a new library to replace the existing one. (That’s only if it is ultimately determined that it is a good idea to tear down the existing library to redevelop the site.) In shorthand terms that means that the replacement building, particularly the library would be fully designed before it is bid. Among other things this would curtail possibilities for bait and switching. • The library should not be shrunk in size to something less than exists now. As any redevelopment would be part of an ongoing increasing in density in Brooklyn Heights and the surrounding area, thought should be given to specifying that any replacement library should be larger in size commensurate with neighborhood growth. 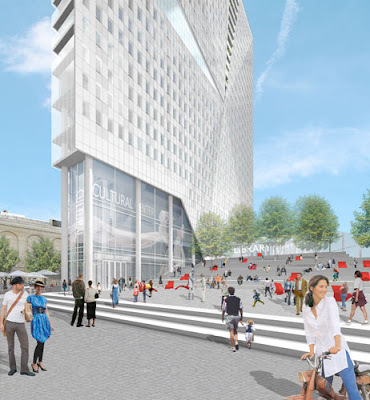 • The Business and Career library should not be moved from its Downtown Brooklyn site in the Central Business District, a hub of transportation, and location near the universities. • There should be no selling off of any real estate used for libraries until appropriate funding to the library system has been restored. This should be an absolute precondition and by taking this position it will put the Brooklyn Heights Association where its should be in terms of providing a united front of communities around the city, not just looking out for an enclave of a neighborhood. • The existing zoning cannot be changed to permit a bigger building, for instance greater density than presently permitted. Similarly, the ability to seek variances to do the same sort of thing should also be hemmed in. • Notwithstanding any imports or transfers of development rights the building will not be taller/bigger than the Brooklyn Heights Association thinks it should be, perhaps the 40 stories that have apparently been the subject of some discussion internally amongst library personnel, maybe something less, 35 stories or 28, whatever. • That provision would be enforceable by the city (meaning more money would have to be paid if it was ever waived) and, for insurance purposes, would also be enforceable by the Brooklyn Heights Association. • Any temporary transition library would have to be open at least as soon as the existing library were to close. It would have to be substantially as good, not smaller and not have less staff. So long as this is assured, assurance that the new library will open within the predicted time frame will be relatively unimportant. It should be recognized that any additional costs of having the temporary transition library reduce the benefit of the transaction and should therefore be identified in advance. The proceeds from the sale of the property should exceed these costs. In addition, if the new library is not in place by the agreed upon date then all of those additional costs should be borne by the developer from that date on. That will also amount to an incentive to complete the reconstruction on time. • Normal construction rules should apply (not like the Atlantic Yards Ratner/Prokhorov “Barclays” arena). There shouldn’t be special permissions for the developer to engage in loud and brightly illuminated construction 24/7. The Brooklyn Heights Association should be able to enforce compliance. Could the Brooklyn Heights Association demand all of the above? Absolutely, and they should demand each and every one of the above. That’s what a neighborhood association is for. Was the Brooklyn Heights Association once able to demand that the neighborhood not be bulldozed for urban renewal? Indeed, it once did and it largely (though not completely) succeeded. This is not the same thing as a private developer looking to build a project as of right where the only restrictions would be the zoning code. These are public assets that are being dealt with, the land underneath the library and the library itself. The real estate belongs to the city. As such the mayor and the City Council need to decide how and whether it is appropriate to dispose of the property, and specify, as they regularly do, what deed and other restrictions should apply. The mayor and the city council are accountable to the public (which includes the Brooklyn Heights Association) in this process and will be subject to a ULURP review so that the public can make all of these recommendations. The library system (this part of it being the Brooklyn Public Library sub-system) owns the library assets other than the real estate. For all intents and purposes the current library "boss" is the current mayor, who appoints almost a third of the system trustees. The same number are appointed by the current Brooklyn Borough President, whose entertainment charities are funded by the mayor’s personal private Bloomberg L.P. “charities” and by the Mayor’s Fund of The City of New York which the mayor controls. And the library depends on the mayor for its operating funds. The public, including the Brooklyn Heights Association, is entitled to demand accountability. If there is a planned no-bid crony-capitalist deal with Ratner now in the works it might actually die on the vine when made subject to the above standards. That, however, would not be a bad thing. It would be a god thing. If there is a deal to be made that wold actually generate enough benefit to make it genuinely worthwhile to the community it would survive these tests. 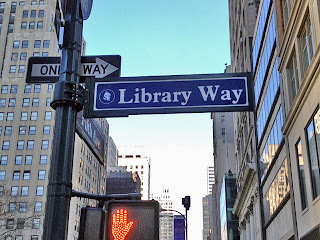 • Saturday, February 9, 2013, Libraries That Are Now Supposedly “Dilapidated” Were Just Renovated: And Are Developers’ Real Estate Deals More Important Than Bryant Park? Here are the two petitions concerning keeping LICH open and preserving the libraries I recommend everyone sign. I would think that because the essential issues are intrinsically the same anyone interested in signing and passing around one of the petitions would also be interested in signing and passing around the other.